This is what we often overlook when we write about work: people exist beyond of systems of labor and exploitation. In the wake of Donald Trump’s election, many of us endured countless lectures about the failure of Democratic elites to appeal to “the working class,” the popular euphemism for white people without money. And indeed, Democrats failed in a plethora of ways. But what seems lost in these analyses, which must seem quaint in hindsight given the ways the Trumps openly exploit the office of the presidency for financial gain, are the ways that poverty is ingrained in our systems of power. We have yet to meaningfully address chronic poverty because it is part of who we are. It is the basis of our systems of governance and taxation. Generations of tax cuts subsidize the fabulous wealth of the elites we’re told to emulate. Government programs supplement the artificially low wages paid by corporations while employer theft from undocumented workers and H-2B temporary laborers facilitate corporate growth. Meanwhile, the resources of social safety net programs dwindle because of the tax-avoidance strategies of the super-rich . If we are to meaningfully address poverty and circumvent the kleptocratic demagoguery of the Trumps, we must begin to think differently about wagelessness and exploitation. We must begin to write about the boss—to examine wealth, and not its absence, as the ill that undermines social welfare. The Trump family at a ribbon-cutting ceremony for the Trump International Hotel in Washington, D.C. Courtesy Chicago Tribune. John Steinbeck’s attempt to capture Cannery Row as “a poem, a stink, a grating noise, a quality of light, a tone, a habit, a nostalgia, a dream” reveals much of what is missing from the way we talk about poverty. For Steinbeck, work crashes ashore in Cannery Row like a wave and vanishes just as quickly. It chews up “the dripping, smelly, tired Wops and Chinamen and Polaks” and, in a torrent of chaos and noise, excretes them to “straggle out and droop their ways up the hill into the town.” When “normal life returns,” it is after this raucous chorus of work has ceased. Many of Steinbeck’s characters openly flout the wage economy—Mack and the boys come to mind—but retain ideas, aspirations, and ambitions. In their own ways, both groups—the workers and the work-less—are victims of the same system. 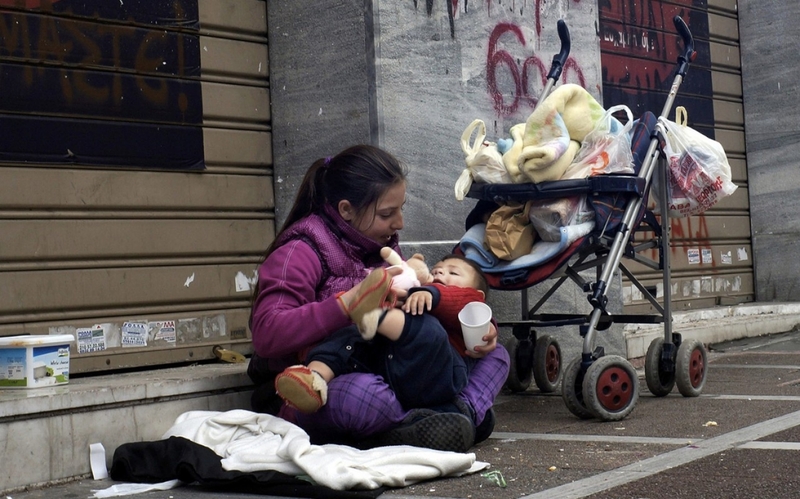 A young mother in Athens plays with her child while panhandling. Courtesy Al Jazeera America. This is what we often overlook when we write about work: people exist beyond systems of labor and exploitation. And it is not only natural that they do, but essential. Exploitative structures are not necessary or inevitable, they do not define us, and they can be rejected and overcome. We’ve included a working table of contents for this month below, which we’ll update weekly. John Steinbeck, Cannery Row, originally published in 1945 (New York: Viking Press, 1963), 1-2.